The Pre-Primary Classroom is designed for children ages 18 months to Age 3. Potty training is not required. Pre-Primary classes are available 3-days or 5-days per week. The sensitive period for language and motor development is between the ages of 18 and 36 months. At Montessori Kids Academy, the Pre-Primary class is where children begin the educational process to help develop these areas. In this class, toddlers are encouraged to find their independence by exploring and making choices in a safe environment. They are given opportunities for learning academically as well as socially. Our youngest students are taught to care for not only their needs, but also the needs of the classroom. They help set the table for snack, sweep the floor, carry their bags to the classroom, and learn to tidy up after themselves. The Pre-Primary classrooms have a vast array of Practical Life activities to teach life skills, as well as traditional Montessori materials to teach language, counting, sorting, and classifying. Children at this age learn about the world around them primarily by using their senses. The Montessori Sensorial materials are specially designed to refine the five senses: tactile, visual, auditory, olfactory, and gustatory sense. Children are particularly receptive to developing their senses from ages 2 to 6, so it is important to give them as many sensorial experiences as possible. 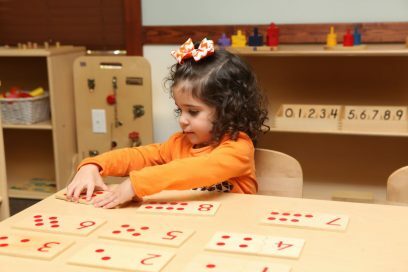 Montessori Sensorial materials are carefully designed to follow the basic Montessori principles. They isolate the quality (for example, the geometric shapes introduced are the same color and only vary in shape). They have a control of error (for example, the child will not be able to fit all of the cylinders properly into a cylinder block if one is out of place). They prepare the child indirectly for future learning (for example, many of the sensorial activities come with ten pieces as an indirect preparation for the decimal system). In addition to Practical Life and Sensorial materials, which encourage concentration and fine motor control, children in our Pre-Primary classrooms enjoy a dynamic curriculum to build foundational skills while embracing their natural curiosity and high energy. Our Pre-Primary classrooms allow students to move freely between lessons and work at his or her own pace. Toddlers learn best through purposeful movement, self-chosen activity, activity that fulfills the needs of the sensitive period, repetition, concentration, and experiencing order. Our Pre-Primary classrooms have toddler sized furniture which enables the children to feel more comfortable and secure, knowing this is a classroom just for them. The activities and materials are specially designed to meet their interest in movement, independence, order, and language. The classrooms are carefully prepared, providing the best possible environment for maximum learning. Montessori Kids Academy has two Pre-Primary classrooms that are fully equipped with Montessori materials. The students have gross motor development, an art teacher directed art curriculum, music and movement, and a separate outdoor play area. Parents may choose from three or five-day schedules, either half day release at 11:30, full day release at 2:30, or extended day until 6:00. Regardless of the program chosen, parents can expect a curriculum that improves concentration, coordination, and a sense of order while children develop their independence. ​Please click here for an overview of the Pre-Primary Curriculum. Please click here for a list of Pre-Primary FAQs. If you are considering a Montessori education for your child, an early start can be integral in his or her academic success in future years. We would like to invite you to schedule a tour of Montessori Kids Academy. Come see what happens in our classrooms, from the Pre-Primary classes, Primary classes, and up to the Elementary classes. Schedule a tour now.